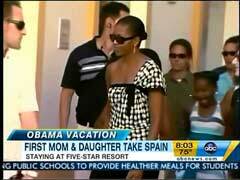 Good Morning America's Yunji de Nies on Friday touted Michelle Obama's "five-star," "luxurious" vacation to Spain, skipping any discussion of controversy over the $148,000 trip. In January of 2009, however, the very same program chided Laura Bush for introducing new presidential dinnerware, despite the fact that the bill was being paid by a private organization. De Nies gushed, "They toured the plaza in old Marbella. Cooled off with chocolate gelato and bought matching sun dresses. Michelle and Sasha Obama are making a splash in Spain." News reader Juju Chang vaguely hinted at criticism, allowing, "Michelle Obama may be taking heat for her luxury vacation with her nine-year-old daughter, but as Yunji de Nies shows us, the Spanish can't get enough of her." ABC brought on reporter Ann Compton to defend the vacation: "Whether they're sitting on a beach or meeting with a king in a palace, it is bringing forth the American culture, the American people, representing the United States of America. It's never really just vacation." Yet, on January 7, 2009, the same Compton worried, "So, why is Laura Bush introducing new Bush china two weeks before they move out?" Co-host Robin Roberts warned about the "brewing brouhaha" and alerted, "President and First Lady Laura Bush are leaving behind a new set of dinnerware when they leave the White House in two weeks." At the very end of the segment, Compton explained that the $485,000 cost was being paid by the private White House Historical Association. DeNies has a history of fawning over Michelle Obama. On October 1, 2009, she predicted that the First Lady's pitch for the 2016 Olympics in Chicago would leave not "a dry eye in the house." On April 29, 2009, she lauded Mrs. Obama as the "belle of the ball." J UJU CHANG: And the First Lady's summer in Spain. Michelle Obama may be taking heat for her luxury vacation with her nine-year-old daughter, but as Yunji de Nies shows us, the Spanish can't get enough of her. YUNJI DE NIES: They toured the plaza in old Marbella. Cooled off with chocolate gelato and bought matching sun dresses. Michelle and Sasha Obama are making a splash in Spain. UNIDENTIFIED SPANISH WOMAN [through translator]: She's very beautiful. Very nice. I couldn't see more, though, because the whole world is waiting. DE NIES: Wherever they go, the press follows. DE NIES: They're traveling with old friends from Chicago. All staying at this five-star resort. Its website boasts lush gardens and luxurious suites. ROBERT GIBBS: It's a private trip and is being paid for that way. DE NIES: She's not the first first mom to jet set with her daughter. Hillary Clinton brought Chelsea around the world. Jenna Bush joined her mother in Africa. ABC's Ann Compton covered it all. And says, there's value to these visits. ANN COMPTON: Whether they're sitting on a beach or meeting with a king in a palace, it is bringing forth the American culture, the American people, representing the United States of America. It's never really just vacation. DE NIES: America's littlest ambassadors have toured Russia's Kremlin, Rome's Coliseum. Even met with Queen Elizabeth. On Sunday, mother and daughter will lunch with the Spanish king and queen, a royal finish to this summer vacation. For Good Morning America, Yunji de Nies, ABC News, the White House. CHANG: I just love the way the Spanish say Michelle Obama.